Preheat oven to 350°F and thoroughly coat an 8 x 8-inch baking pan with non-stick spray. Add brownie mix, beer, eggs and melted butter to a large bowl and stir together until just combined. Transfer batter to pan and top with chocolate chips. Bake brownies until a tester comes out clean from the center, about 35 minutes. 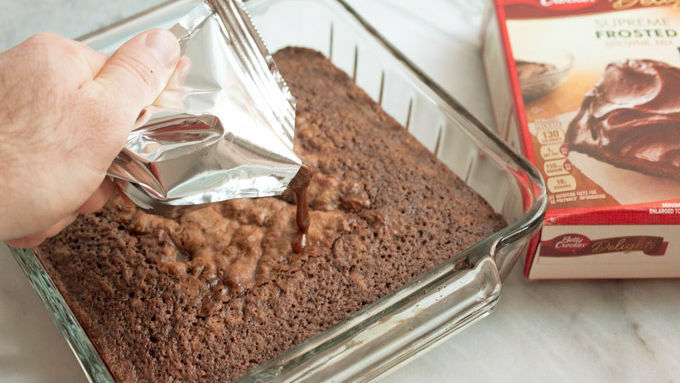 Remove brownies from the oven and let cool completely. Frost with fudge frosting included in brownie mix package. You might not usually think of pairing chocolate and beer, but this unlikely duo is so delicious together—especially when that beer is a good, dark stout. 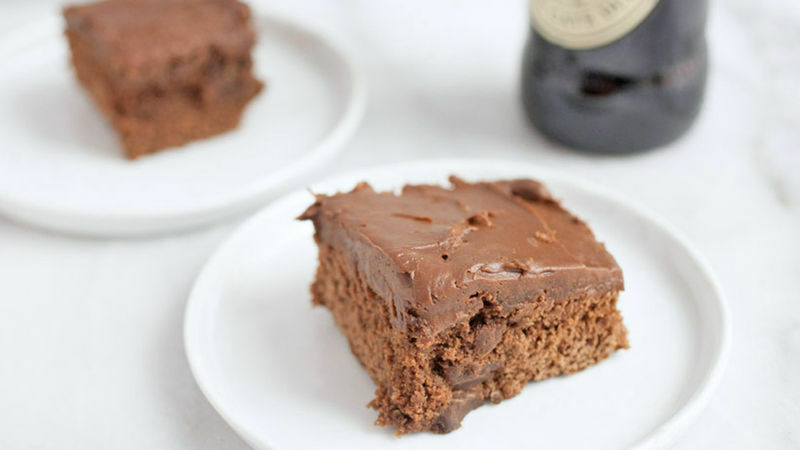 Chocolate lovers and beer lovers alike will go crazy for these rich and chocolaty brownies with Guinness™ Extra Stout in the mix. I wish I could tell you these were hard to make. They taste like they are! But they’re incredibly easy. The trick is to use Guinness™ Extra Stout beer (you don’t need the whole bottle) instead of water, and melted butter instead of the oil that is usually called for in brownie mix instructions. Stir this all together in a large bowl with a couple eggs and you’ll have a great batter ready to be baked! I really recommend baking it in an 8 x 8-inch baking dish so the brownies end up thick. If you only have a 9 x 13-inch dish, DOUBLE the recipe to make sure you have enough batter. (Besides, 2x the brownies is never a bad thing.) Once you’ve transferred the batter to a greased pan, sprinkle it with chocolate chips and bake about 35 minutes, or until a tester comes out clean from the center. If you like your brownies on the gooier side, feel free to pull them a few minutes early. Once the brownies have cooled, you can top them with the fudge frosting in the brownie mix. It really doesn’t get easier. These will go fast on any dessert plate. DIG IN! You might not usually think of pairing chocolate and beer, but this unlikely duo is so delicious together—especially when that beer is a good, dark stout. Chocolate lovers and beer lovers alike will go crazy for these rich and chocolaty brownies with Guinness™ Extra Stout in the mix. I wish I could tell you these were hard to make. They taste like they are! But they’re incredibly easy. The trick is to use Guinness™ Extra Stout beer (you don’t need the whole bottle) instead of water, and melted butter instead of the oil that is usually called for in brownie mix instructions. Stir this all together in a large bowl with a couple eggs and you’ll have a great batter ready to be baked! Once you’ve transferred the batter to a greased pan, sprinkle it with chocolate chips and bake about 35 minutes, or until a tester comes out clean from the center. If you like your brownies on the gooier side, feel free to pull them a few minutes early. 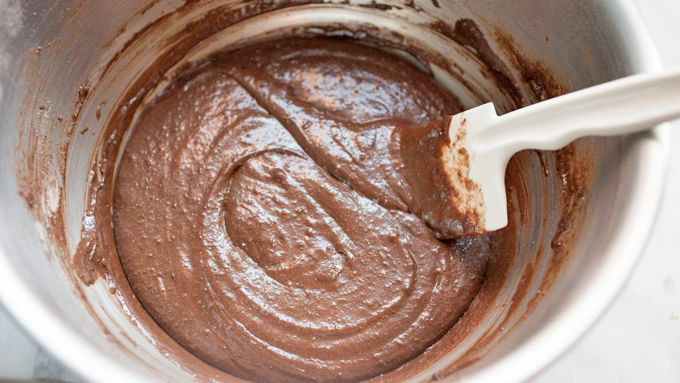 Once the brownies have cooled, you can top them with the fudge frosting in the brownie mix. It really doesn’t get easier. These will go fast on any dessert plate. DIG IN!